This is part one of three part series in which Museum of Anthropology at the University of British Columbia (MOA) intern Nikki Peck shares a behind-the-scenes look into creating the Lawrence Paul Yuxweluptun: Unceded Territories exhibition. The Museum of Anthropology recently opened a new exhibition: Lawrence Paul Yuxweluptun: Unceded Territories. Lawrence Paul Yuweluptun is a Coast Salish artist who focuses on addressing social, political and physical injustices of aboriginal culture. I discovered that MOA was featuring Yuxweluptun in his biggest retrospective in 20 years. I wanted to get involved. 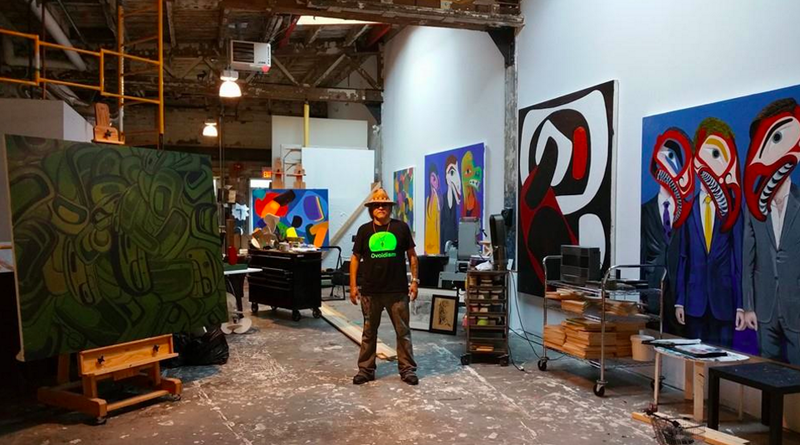 Since I was twelve years old, I have visited Lawrence Paul Yuxweluptun’s studio numerous times with my father. As well, last year I graduated from Concordia University in Montreal with a major in studio arts and art history. I had written several papers on Yuxweluptun and had become captivated by his use of colour and his bold political statements on Native sovereignty. I decided to offer my time to MOA as a volunteer intern one day a week. So last April I met with Karen Duffek, curator of Contemporary Visual Arts at MOA and co-curator with Tania Willard of the exhibition, to talk about internship possibilities. Luckily, here I am! I loaded up Karen’s car with the equipment and we arrived at the artists’ studio on East 7th and Main. We put some money in the meter (enough for two hours) and entered the studio. We greeted Lawrence and started setting up. 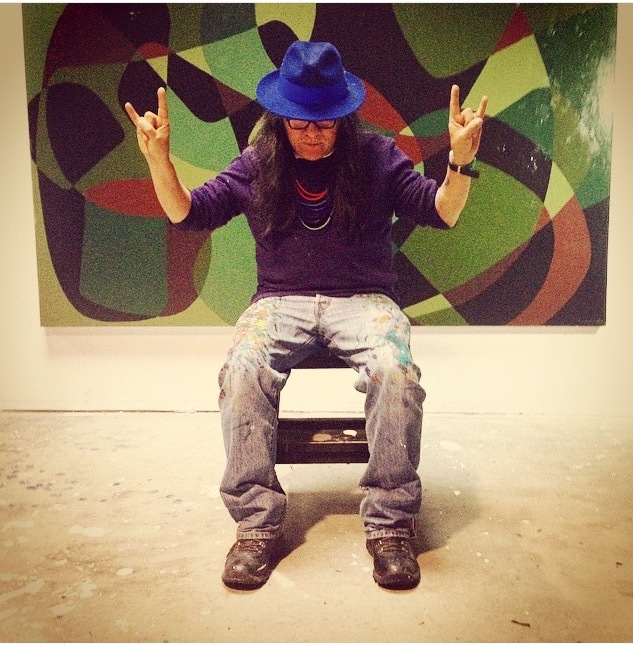 He sat down in front of a large painting of trees, still in progress, and wearing his trademark cedar-bark hat. He was ready. I put a fully charged battery in the camera, docked it on the tripod, turned the recorder on and hit start. Everything was in order. Tania Willard began by saying, “Let’s start with the title: Unceded Territories.” He paused to think for a second, and started speaking. That one prompt was all he needed. Over the next three hours, I had to change the video camera battery two times and run out to put more money in the parking meter. Lawrence was thoughtful and outspoken; a lot of suppressed emotion surfaced in a clear and intensely focused monologue. The issues he talked about were urgent and intense: He talked about native society within the construct of modern society and the struggle between current ownership and native land claims in Canada. I was captivated. I am certain this exhibition will blow people’s minds. Memo to file: Bring more quarters for the parking meter next time.